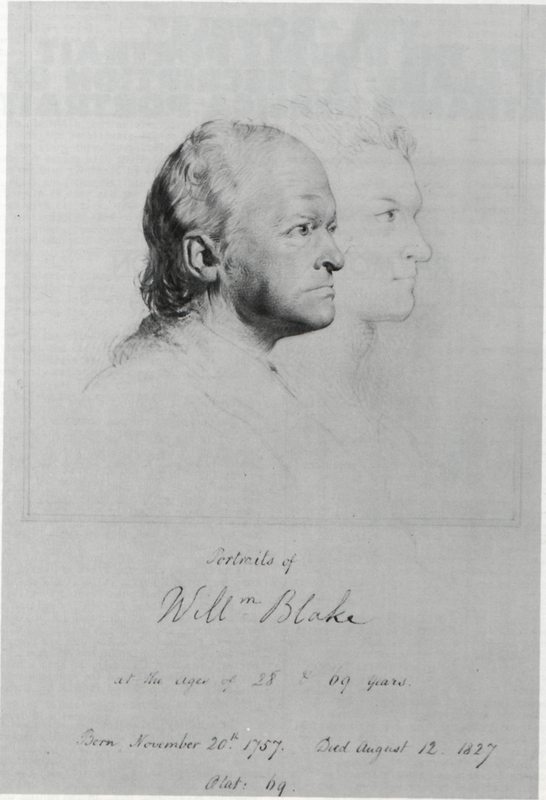 The double portrait of Blake, “William Blake in Youth and Age,” by Frederick Tatham, in the Collection of Mr. and Mrs. Paul Mellon since 1964, is surely one of the better known representations of the poet. It has been reproduced in Blake—related publications on several occasions and recently in the William Blake Trust volume devoted to Blake portraiture.1↤ 1 Geoffrey Keynes, The Complete Portraiture of William and Catherine Blake (London: Trianon Press for Blake Trust, 1977). The double portrait is reproduced as Plate 41 and is discussed on p. 144. This is a reproduction of the entire sheet, whereas most, if not all, prior reproductions omitted the inscription portion of the sheet. There, Keynes discusses this drawing in some detail and then reminds the reader that Tatham also made an enlarged replica of it for the Butts family. Having done so, he at once passes on to his next topic leaving those desiring further information on the replica portrait to seek it elsewhere. But where?—a question which prompted me to look into this matter, and which resulted in this account of my findings. In contrast with the original portrait, it appears that detailed information about the replica is not widely known. I found no account specific to this work. And while it has been exhibited on several occasions, with one important exception, these exhibitions were otherwise unrelated to Blake. Further, I found but two reproductions, both of them illustrations in catalogues for exhibitions which probably had limited exposure. The replica’s existence has been largely forgotten; at the very least, it has been neglected. However, for most of the past decade it has been on public display in The Denver [Colorado] Art Museum. Quite by chance I came upon it there some five years ago—a bit of good fortune which gave me a head start in my investigation. In addition, I received a most helpful tip from Sir Geoffrey Keynes early on.2↤ 2 It should not be thought that the brevity of Keynes’ remarks about the replica in Portraiture resulted from a lack of information on his part. He not only informed me as to which Butts sale it was consigned, but indicated that he had some personal contact with this work about the time of the sale. As in the case of the original portrait, the year in which the replica was executed is not precisely known. However, Keynes now ascribes “circa 1830” to the former and it seems likely the replica was done soon after.3↤ 3 Keynes’ Portraiture contains revised dates for some of the Blake portraits previously listed in his A Bibliography of William Blake, (1921). There, Tatham’s original portrait is dated “1827”; the replica is not cited. Catherine Blake’s sketch (“William Blake as a Young Man”), long considered to be a source for Tatham, is there dated “1785”; Keynes now favors “circa 1828.” The drawing “William Blake” by Thomas Stothard, which Keynes now considers to be another possible source for Tatham’s youthful image of Blake, was not cited in the 1921 publication, but carries a date of “circa 1780” in Portraiture. Catalogue citations for the replica portrait have usually carried the date “circa 1826” which placed it earlier than the previously accepted date for the original. The replica portrait remained in the Butts family and in 1905, upon the death of Captain Butts (the grandson of Blake’s great patron, Thomas Butts), passed into the hands of his son, Anthony Bacon Drury Butts. It was later included in the Sotheby & Co. auction of 19 December 1932. The portrait (Lot 117 in the sale catalogue)4↤ 4 Catalogue of Valuable Printed Books, Illuminated & Other Manuscripts, Autograph Letters and Historical Documents, Relics of William Blake, &c. . . . Messrs. Sotheby & Co. . . . Monday, the 19th of December, 1932, [London]. This sale is sometimes referred to as the “final” Butts sale. was the first of twelve lots consigned by Mr. Butts, collectively designated “Relics of and Miniatures Painted by William Blake.” The Sotheby catalogue file in The British Library indicates that it was purchased by “Ulysses” for five pounds. The purchaser was, in fact, Jacob Schwartz the expatriate American who operated The Ulysses Bookshop in London and New York. The portrait was then listed in the shop’s catalogue issued in early 1933, and the American collector T. Edward Hanley obtained it from Dr. Schwartz in that year.5↤ 5 A Catalogue of Rare Books, Pictures, Manuscripts & Letters, (The Ulysses Bookshop, New York, ). The replica is Item 3. The citation discusses both the original and replica portraits, and clearly indicates that it is the larger copy being offered. However, the reader is instructed to “see front cover” which, curiously, features a reproduction of the portrait area only of the original rather than the replica. 1 “William Blake in Youth and Age” by Frederick Tatham. From the Collection of Mr. And Mrs. Paul Mellon. 2 Replica “Portrait of William Blake” by Frederick Tatham. The Denver Art Museum. begin page 32 | ↑ back to top me that the replica was a favorite of Dr. Hanley who, when given the opportunity, included it in these exhibitions along with their Blake works. The earliest and most notable such instance I uncovered was the great Blake exhibition held at the Philadelphia Museum of Art in 1939. The replica is Number 216 in the exhibition catalogue.6↤ 6 William Blake 1757-1827: A Descriptive Catalogue of an Exhibition of the Works of William Blake Selected from Collections in the United States (Philadelphia: Philadelphia Museum of Art, 1939). All later showings of the replica were in “Hanley exhibitions” held during the next thirty years. Two of the earliest, 1946 and 1960, were at the Albright (now Albright-Knox) Art Gallery. The catalogue for the 1946 showing includes a small reproduction. In 1957 the replica was exhibited at the Philadelphia Museum of Art. During the period 1967-70, foremost among a number of exhibitions of selections from the Hanley Collection that included the replica portrait was a series of four showings of an exhibition initiated jointly in 1967 by the Gallery of Modern Art—including the Huntington Hartford Collection—and the Philadelphia Museum of Art. The exhibition later traveled to the de Young Memorial Museum, San Francisco (1967-68) and finally, to the Denver Art Museum (1968). Another exhibition, this one in 1969 at Canisius College in Buffalo, N.Y., included the replica, which was reproduced at a very small size in the exhibition catalogue.7↤ 7 The two Albright exhibitions were “The T. Edward Hanley Collection: Drawings,” 4 October–3 November 1946[e] (cat. no. 18, illustrated), and “The T. Edward Hanley Collection: Drawings, Watercolors, Pastels,” 6 January–14 February 1960[e] (cat. no. 50). The Philadelphia exhibition was “The T. Edward Hanley Collection,” 8 February–28 April 1957[e] (p. 3 of unnumbered checklist). The four identical exhibitions were all entitled “Selections from the Collection of Dr. and Mrs. T. Edward Hanley, Bradford, Pennsylvania” and shown as follows: New York, 3 January–12 March 1967;[e] Philadelphia, 6 April–28 May 1967;[e] San Francisco, [?] December 1967–11 February 1968;[e] and Denver, 22 February–30 April 1968. [e] The first two shared a common catalogue (unnumbered, p. 67). The same catalogue, with a new title page, was used at Denver; it appears that the San Francisco catalogue was similarly produced. The Buffalo exhibition was “Works from the Hanley Collection at Canisius College,” 23 November–23 December 1969[e] (cat. no. 233, illustrated). In 1969 the portrait, with numerous other works, was given in trust to the Denver Art Museum, and in 1974 the trust was converted to a gift—the T. Edward and Tullah Hanley Memorial Gift to the People of Denver and the Area.8↤ 8 The present acquisition number of the replica is 1974, 398. Both Tatham’s original and replica portraits are presented here as illus. 1 and illus. 2, respectively. 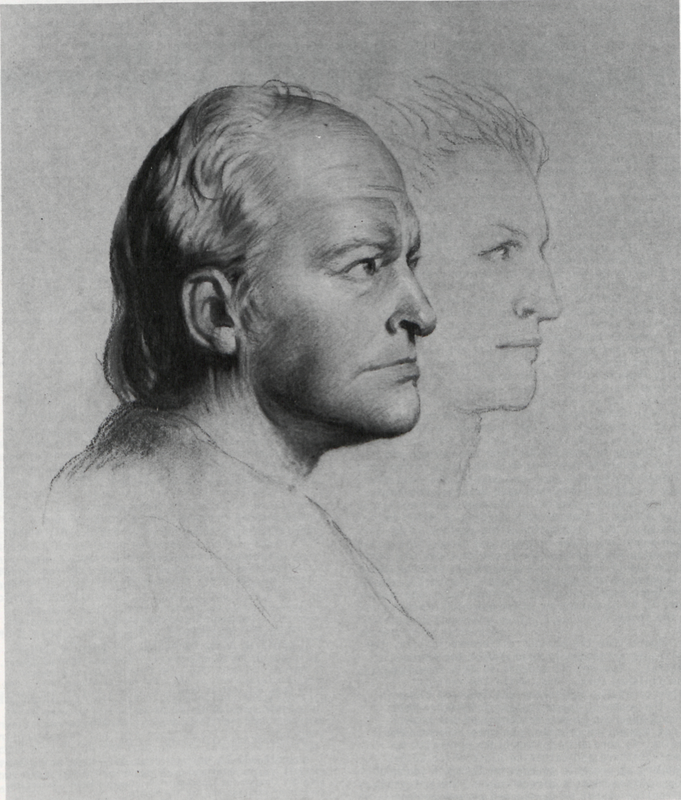 The titles listed are those presently used, though in some exhibitions the replica was titled “Double Portrait of William Blake.” The original is in sepia wash and pencil; the head of Blake in age is a finished wash drawing, the head in youth a pencil sketch. The sheet measures 343 × 264 mm, a considerable portion of which is taken up by the inscription. The replica is on brown paper and drawn in black and brown chalk with white highlights. The sheet measures 645 × 525 mm and is “glued” to a wood panel, and the whole is mounted in an “ebonised frame”—presumably the same frame mentioned in the Sotheby sale catalogue. There is no signature or other notation visible on the sheet.9↤ 9 Details concerning the physical characteristics of the replica portrait and its relationship to the Denver Art Museum were provided through the kindness of Ms. Cameron Wolfe, Associate Curator of European Art for the Museum. Apart from the obvious difference in size, the replica is a reasonably good double for the original. However, it appears to be a somewhat less finished work. And, while the replica rather carefully duplicates the image of Blake in age, the youthful image is less faithful. This is most apparent in the rendering of the nose, if not the entire profile. In this respect, the original is more akin to the Blake portraits by Thomas Stothard and Catherine Blake which Keynes considers as probable sources of Tatham’s youthful Blake. Since it is a direct copy of the original, the replica cannot be considered an independent portrait of Blake, and so cannot provide additional insight into his appearance. However, its association with the Butts family gives it a considerable measure of importance. Indeed, it is yet another Blakean legacy that has come down to us from Thomas Butts; one which, due to the generosity of the Hanleys, is in the public domain. And, I hope, by virtue of this account, now better known to those interested in Blake portraiture.